MIAMI — A Miami-Dade police officer was relieved of duty last week after video circulated on social media of three officers taking a woman to the ground, then handcuffing and arresting her — after the woman had called police to report a man had pointed a shotgun at her, police said. The incident took place early last week in South Miami-Dade. The video shows three officers questioning the woman, then pushing her toward a fence on a sidewalk, before wrestling her to the ground and cuffing her. Miami-Dade Police Director Juan Perez reacted publicly to the incident late Wednesday night, saying on Twitter that the department has begun an investigation after learning of the video. He also said that one of the officers — who hasn’t been named — has been relieved of duty pending an investigation. “I find the actions depicted on the video very troubling and in no way reflective of our core values of integrity, respect and fairness,” Perez said. Perez said while the woman was being taken into custody, police were questioning the man who allegedly pointed a weapon at her. Police were notified of the incident with a call just after 7 p.m. March 5 about an aggravated assault with a shotgun at a home in the 11300 block of Southwest 201st Street. After sparring with Tumm, Loving told police he verbally threatened her and pointed a shotgun at her. Tumm denied he owned a weapon, police said. And a witness backed up his claim. But a few minutes later, according to the report, the witness recanted and said Tumm did point a weapon at Loving. Police said while speaking with him, Tumm refused to leave his property. At some point, police said, Loving “began acting belligerent” and “irate” and refused to obey commands. Officers said she began screaming and caused a scene. The two officers listed on the arrest form are A.I. Giraldo and J.F. Calderon. It wasn’t clear Thursday whether either one of them had been suspended. As of Thursday, Tumm, the man questioned by police and accused of pointing the shotgun, hadn’t been arrested or charged with a crime. Perez said the officer relieved of duty was a tenured cop who was working with two rookies. “I don’t know what got into his mind,” Perez said. 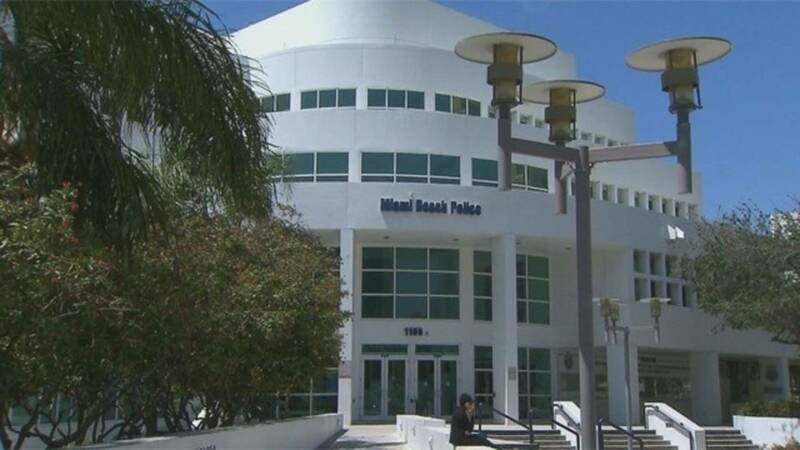 MIAMI BEACH, Fla. – A Miami Beach police officer has been suspended after he was accused of sexual misconduct while on duty. Officer Ernesto Rodriguez, a spokesman for the Miami Beach Police Department, said Wednesday that Officer Jorge Ortega has been suspended with pay while the department conducts an internal affairs investigation. Oates said Ortega joined the force in March 2016. Police did not give any further details about the allegations, including when or where the alleged misconduct took place. MIAMI — Three Miami police officers are facing federal drug trafficking charges after they were snared in an FBI undercover operation.Authorities say the three received thousands of dollars in payments to protect purported shipments of illegal drugs and drug proceeds. The FBI says the officers at times transported purported cocaine and other drugs themselves. In a statement on Twitter, authorities said they were responding to a call about “unruly teens, who had been harassing patrons and causing a disturbance” outside a mall. “It was just too much because it just makes you angry,” Jessica Dennis, the girl’s mother, said of the video. A viral video appears to show police in Coral Springs, Florida, pinning an unnamed 14-year-old black girl to the ground and punching her. The video was first posted to Instagram by Victoria Cedeno, who said she is the girl’s cousin. In the post, the police department said the viral video is misleading. “As with all social media posts, it shows only the end of the story, not the incident in its entirety which led up to the arrest,” the statement said. Police said that as they put the girl in a patrol car, she “violently kicked” one officer. Per the statement, she was arrested, identified, and brought to a juvenile assessment center. Speaking to Fox-affiliated WSVN, the girl’s mother, Jessica Dennis, said she didn’t understand how this could happen. Dennis and her daughter have hired attorney Meeghan Moldof, who said the officer who punched the girl used excessive force. Dennis said the video was hard for her to watch and made her feel like she “can’t trust” local police. This incident isn’t the first of its kind. Earlier this year, two white police officers who pepper-sprayed a 16-year-old black teenager who was suspected of skipping school defended their actions by saying he was giving them “attitude.” In July, a Chicago police officer was under investigation after threatening to jail two black men for walking in the street. Three Florida police officers were sentenced to a few years in jail for framing innocent people for crimes. Ajudge finally sentenced a group of ex-police officers in Biscayne Park, Florida who were involved in a huge corruption scandal this week. The three officers were found guilty of framing innocent people for crimes and received a lighter sentence than many defendants who are jailed for longer periods and for minor reasons. The three officers — Guillermo Ravelo, 37, Charlie Dayoub, 38, and Raul Fernandez, 62 — were given less than three years in jail each. On Thursday (Oct. 18), Ravelo received 27 months behind bars as part of the Biscayne Park Police Department’s conspiracy to blame people for crimes they didn’t commit. On Wednesday, Dayoub and Fernandez got one year apiece for making false arrests, the Miami Herald reported. Dayoub and Fernandez specifically played a role in falsely pinning burglaries on a 16-year-old teen as part of their twisted goal to clear 100 percent of all property crime cases by racist means. Ravelo wrongfully charged two men with burglaries and used excessive force on a man during a traffic stop. The town’s police chief, Raimundo Atesiano, 52, was also fired and indicted for pressuring the officers into the wrongful arrests. Atesiano, who pleaded guilty to a civil rights conspiracy charge ahead of his trial in September, faces up to 10 years in prison when he is sentenced in November. The corruption cases highlighted how officers can violate the civil rights of people, a pressing issue that finds its roots in history. It also sheds light on the blue wall of protection in police departments, as the officers stuck together in framing people for offenses. With the cases’ significance, the officers have been punished but have received lighter sentences than some American jailed for less significant things such as voting. Crystal Mason, a mother in Texas, was sentenced to five years in prison for alleged illegal voting earlier this year. The Florida police and Mason cases beg the question of whether the crime fits the time. Police in Biscayne Park, Florida had intentionally penned crimes on African Americans to report a higher crime solving rate. A former Miami-area police chief and two other ex-officers under federal indictment for framing Black suspects to achieve a higher crime-solving record are now facing a lawsuit. The 16-year-old Black teen named as one of the targeted people in the case has sued the ex-cops for violating his civil rights by wrongfully pinning burglaries against him in Biscayne Park, Florida, the Miami New-Times reported Tuesday. Raimundo Atesiano, who previously led the police department in the small suburb just north of Miami and left the job in 2014, had intentionally ordered officers to make false arrests of African-Americans to maintain a “fictitious 100 percent clearance rate of reported burglaries,” according to a U.S. Department of Justice release about the Biscayne federal indictment made public last month. An internal probe had outed Atesiano, who also directed former Officers Charlie Dayoub and Raul Fernandez to arrest the teen, identified as “T.D.” in federal court filings, in June 2013. Another ex-cop, Guillermo Ravelo was also named in the indictment but is not a defendant. Ravelo, Dayoub and Fernandez have all pleaded guilty to various crimes associated with the racist schemes case, including conspiracy to violate civil rights under the color of the law. All four former law enforcement figures have been named in the teen’s lawsuit, as well as the Village of Biscayne Park. The teen, referred to as “T.D.,” had four burglaries falsely blamed on him by the corrupt ex-officers from April – May 2013. He also separately received 22 different traffic violations issued by Ravelo that same year, the suit alleged. “The defendants were part of a conspiracy to satisfy the Village that crime was being eliminated,” the suit said. Miami-Dade County prosecutors reportedly dropped T.D.’s charges after the State Attorney’s Office noticed problems in the police arrest affidavits. T.D. could win a hefty settlement from the lawsuit. If the ex-cops are convicted in the indictment case, Dayoub and Fernandez each face a maximum statutory sentence of 11 years in prison while Atesiano faces a maximum of 12 years, the Justice Department said.